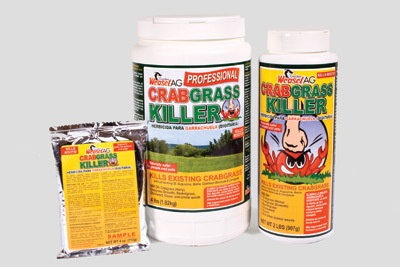 Agralawn Crabgrass Killer is an all-natural organic weed control used to kill crabgrass, basket grass, chickweed, clover and other similar weeds. It is fast-acting, but will not harm common lawns like St. Augustine and Bermuda. Cinnamon bark is the active ingredient. If your weed problem consists of the aforementioned plants, there's really no need to spray your lawn with unsafe chemicals. A: Yes; AG crabgrass control is safe around people, pets and the environment. A: It's very easy; just wet the area you want to treat with water and sprinkle the crabgrass control over the area. Q: How big of an area will the bottle treat? A: One 2 lb. bottle will treat 100-200 sq. ft., depending on the applicator. Q: Will it kill the seeds? A: No; it will only kill actively growing crabgrass and weeds. Q: Will it hurt my grass? A: Crabgrass control will not harm St. Augustine, Bermuda or Bahia grasses. Other grasses are being tested throughout the country. A: It will work; just make sure the area is wet enough and evenly treated. It’s very easy to use. Q: What do you mean “wet enough” and why does it turn yellow? A: The Crabgrass Control turns yellow to let you know it has been fully activated. Water is the source of its activation so enough water is needed to activate the process. Q: Why do I want it “activated"? A: Within minutes of activation the product begins to kill the weeds. Q: How can I best “activate” the product? A: Use a spray bottle, backpack sprayer, water hose or irrigation. Q: How long should I “not disturb” the product after it turns yellow? A: Leave the area undisturbed for 24 to 48 hours. Q: What do you mean “undisturbed?" A: This product is taken in through the weed’s leaves and will not be taken up through the root system. Irrigation, mowing and rain can disturb the product enough so as to reduce the desired results. A: You may think more is better, but piling this product on weeds will only cost you more. A nice, light to medium application is adequate, as long as activation was accomplished. Q: Is it temperature sensitive? A: No; in all of our years of testing AG Crabgrass Control has been 100% effective in all temperature zones in North America. A: Yes; but applying it to weeds that are already dead or completely dormant would be a waste of product. Q: Do you have any tips to help me save money on your product? A: Yes. Remember to completely cover the area you want treated. Try and catch weeds at their smallest stage or simply mow them down to reduce the size and area you have to cover, reducing the amount of product you’ll need. Do not completely remove the weeds as the treatment must be absorbed by the leafy part of the weeds. When used properly, AG causes very little reaction or yellowing to St. Augustine or Bahia lawns. Applying during the a.m. hours while morning dew is present works best, or you can wet the affected area with a hose, irrigation or spray bottle. Apply only to the affected area, being careful to dust all of the weeds and/or weed grass you want to control. This product will turn from white to a bright yellow when applied to indicate adequate moisture is present. Apply a light to medium coating in even strokes. Noticeable results should be seen in 3 to 5 days. To avoid washing away product, don’t apply if rain is forecasted or directly before watering the lawn. Reapply as needed. For more information, go to Agralawn Crabgrass Killer.